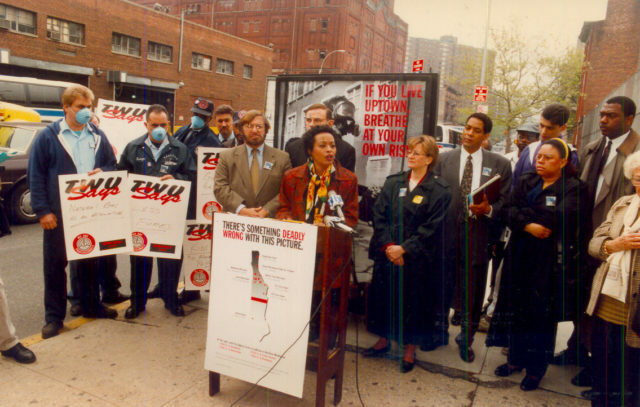 In May 1997, WE ACT launched a major public awareness campaign urging the MTA to commit to modifying bus depots to accommodate natural gas buses, and to invest in clean-fuel buses only. A study conducted by the Environmental Protection Agency (EPA) provided solid evidence that the levels of air pollution in a number of Northern Manhattan neighborhoods at the time exceeded proposed federal standards by as much as 200%. In the face of mounting scientific evidence that linked the tiny particles from diesel exhaust fumes to increasing threats of asthma, emphysema, bronchitis, heart attacks, lung cancer and premature death, the MTA continued to purchase deadly diesel buses. By doing so, they were putting a price tag on the health of over a half million predominately African American and Latino New Yorkers. In November of 2000, WE ACT and several Northern Manhattan community residents filed a Title VI Complaint with the United States Department of Transportation (DOT) charging the MTA with violating the civil rights of Northern Manhattan residents. In response to that complaint, the DOT concluded that the MTA must give due consideration to environmental justice principles in its siting decisions. Through our MTA Accountability Campaign, WE ACT worked to ensure that the MTA puts the DOT’s mandate into practice. The goal of WE ACT’s Dirty Diesel Campaign was to heighten the awareness of community residents, and encourage the MTA to commit to a policy that would allow them to be part of the solution – not the problem. WE ACT’s campaign was a catalyst for the MTA investing in diesel retrofits and hybrids. The MTA now boasts that it has the cleanest fleet in the nation.